Beyoncé may seem like the queen of the surprise album drop, but keen members of the Beyhive are usually able to look back and pinpoint plenty of clues in hindsight (like that time she kept giving us lemons and then — BAM! — Lemonade). 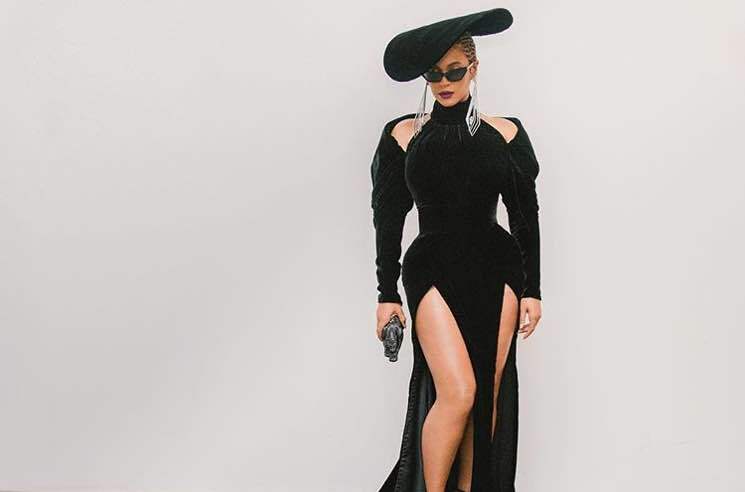 This time, fans are trying to get a leg up on Queen Bey, reading into some of her recent fashion choices that seem to be hinting at a Black Panther-related project and perhaps her involvement in its mysterious soundtrack. While attending the Grammys this past weekend (and leaving one woman particularly shook in her presence), Beyoncé sported three different glamorous looks — one that was accessorized with a black panther-shaped clutch, one topped off with a Black Panther-inspired beret and another accompanied by panther-shaped earrings. While Bey's support of the revolutionary Black Panther Party is nothing new, her choice of accessories has caused many to speculate that Beyoncé may be appearing on the still unrevealed soundtrack to Marvel's new Black Panther movie. As previously reported, Kendrick Lamar is executive producing the soundtrack, and so far we've only heard his SZA collab "All the Stars" and "King's Dead," which featured Kendrick teaming up with Future, Jay Rock, James Blake and Mike WiLL Made-It. With most of the tracklisting still to be announced, the Beyhive is getting pretty excited at the prospect of some new music on the film soundtrack. Beyonce wore not one, but TWO looks during the Grammys weekend inspired by the Black Panther Party… And her purse was a rhinestoned black panther. Low-key confirms my theory of Beyoncé being on the Black Panther soundtrack . Especially since she has to work with Disney anyways because of Lion King. Might as well also secure the bag with Marvel. The Ryan Coogler-directed film premiered last night (January 29), and will hit theatres for wide release on February 16. The soundtrack is due for release a week earlier, on February 9, and is available for pre-order via Umusic.